I know there may be some skeptics out there who say cats can’t be trained. I am here to tell you otherwise. Cats can be trained and they actually thrive at it. Not only is it fun for both human and feline, but it’s a great way to develop and strengthen the bond between a person and their cat(s). Plus, it’s wonderful enrichment for the cat, both mentally and physically. 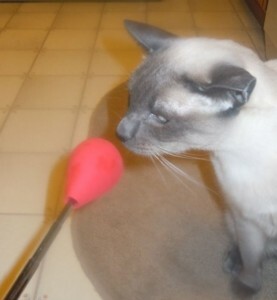 Why a Clicker: It accelerates the learning process and makes training more clear cut for your cat. Reinforcement: a primary reinforcement is food. Keep treat sizes very small, half or quarter of a pea size. Make sure they are high value, tiny pieces of tuna or cut up chicken works well. Baby food (meat purees) works well too, just let your cat have a brief lick. Secondary reinforcements can be petting and playing. Charging the Clicker: This is making a positive association between the clicker and the reinforcement. To do this, Click the clicker and then follow it up with a treat within one second of the click. Repeat this exercise for at least 15-20 repetitions. Now your cat will be classically conditioned that when he hears the clicker, good things will come his way. Remember to reinforce your cat EVERY time you click him, even if it’s by accident because we don’t ever want the clicker to loose its value. Now you can use the clicker to mark behaviors you want. You will be using lures, shaping, and capturing behaviors you want your cat to repeat or offer more of. In most cases you will have to break the end goal behavior down into several steps, these are called approximations. Let’s say we want our cat to learn to sit. We can first lure the behavior by showing the cat a small treat and then raising it above their head and then slightly towards their back so that they will naturally want to sit back on their haunches. As soon as their rump touches the floor, Click and give them the treat. Do this three times in row, clicking and rewarding for each successful Sit. Then try the hand motion without the food lure. If your cat is successful, click and then immediately grab a treat and feed. We want to move away from food lures quickly because otherwise it becomes a bribe and your cat will only perform the behavior when food is present. 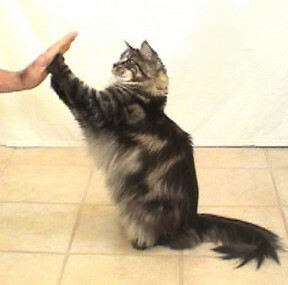 After your cat is predictably sitting in position with your hand signal, now you can add the verbal cue, Sit. Here is the sequence of events: Fluffy Sit-pause-hand signal-cat sits (Click)-Reward! Another way to teach the Sit, is to capture it. Wait for your cat to naturally sit, then Click and reward. Once you can predict when your cat will sit again, you can give the verbal cue right before they offer the behavior. If you’d like to teach your cat to walk on leash, the first step is getting the cat acclimated to wearing a harness. This can be done through approximations. It’s best if the cat will naturally harness themselves. The initial step is get your cat to Target onto the harness by himself. Have the harness, clicker and treats ready. Hold the harness up, if your cat looks at the harness or better yet touches it with his nose, Click and reward. Take the harness out of view from the cat immediately after clicking. Then present the harness again and wait for your cat to target onto it. Repeat several more times. Through approximations you can get your cat to put his nose in the head hole, then his entire head. In those steps, be sure to click when the cat’s nose or head is through the opening and treat in that position. You can also lure your cat into sticking his head through the opening on his own. Only allow him access to the treat if he sticks his head through the opening, as soon as he does, Click and reward. Eventually you’ll be able to clip the harness into place. Next attach a leash and let your cat drag the line. At the first movement, click and reward. Try tossing a treat for the cat to walk to, when he does, click right before he gets to the treat and eats it. Then the next step is to encourage the cat to follow you. You can use a food lure at first or a toy to drag. Click when he’s following and then reward. You’re now on your way to having a cat that walks on leash. These steps may take several days to weeks to accomplish. It depends on your time, dedication and patience. There are endless things you can teach your cat: roll over, lie down, jump over obstacles, high five or shake, come when called etc…Remember to break behaviors down into easy to teach steps. Don’t rush your cat and keep sessions short, 1-5 minute sessions, no more. To add value to your cat’s reinforcements, keep your cat on a regulated diet and keep some high-value toys in reserve for special training sessions. This is the final installment of Rocket Recall. This week we will talk about pressure and distractions with our dogs. Even with all the best preparation and practice, there will be times when your dog will not want to come away from something. This is where pressure comes into the equation. It is very important that our dog comes when called, like previously stated, this could save his life someday. Again, we want to make sure our dog is ready for this next step before we get started. If your dog has not accomplished the first two levels of Rocket Recall, then they are not ready to begin this level. Each level can take weeks to accomplish, so don’t be in a rush. Be patient and practice, practice, practice! Have a long-line attached to your dog when training this next level. 30-40 feet is an appropriate length for the line. Be sure the line isn’t to heavy for your dog. If you have a small breed dog, you may need to make your own long-line, which is easy enough to do*. You’ll be enlisting the help of another person for this training as well. Have your helper distract the dog with some low-value treats and then call your dog to come. Your helper will stop treating and ignore your dog. You will reward your dog with higher-value treats when he comes to you. Have your helper open their hand with treats, when you call your dog this time, your helper will keep their hand open. If your dog doesn’t respond within 3 seconds and come off your helper, you’ll pick up the long-line and gently reel them in. Again rewarding heavily when your dog comes all the way into you. Do not repeat the cue to come multiple times. 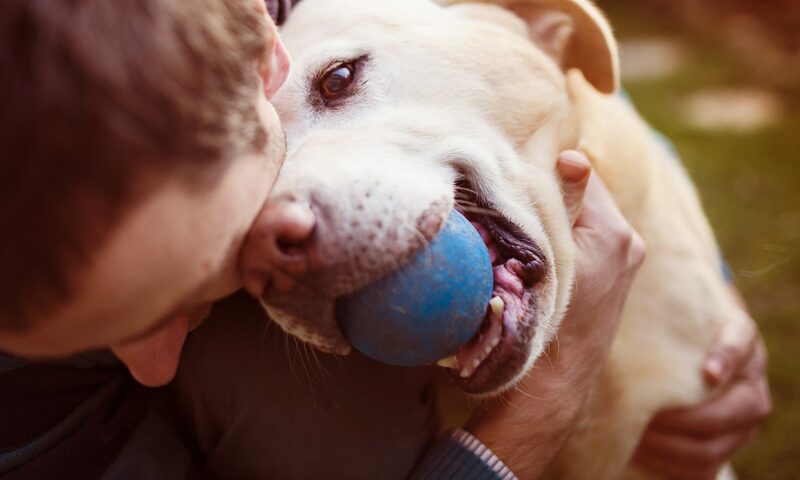 DO reward your dog heavily when he comes to you–with treats or toys. DO be animated with your dog so that you’re more appealing to them–cheerful voice, clapping hands, kissing noise, and running away from your dog will elicit more attention. For adding distraction, build on the Running Game. Have your helper run away from your dog and entice them to follow. You call your dog to you, your helper stops and stands still, ignoring your dog. When your dog comes to you, reward. The next step is to have your dog come even when your helper continues to run. For this, you’ll use the long-line again. 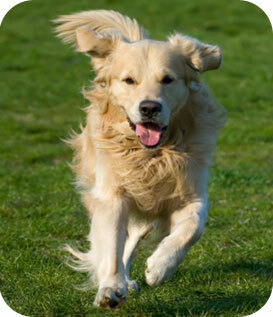 Have your helper run at a slower pace or a brisk walk, so that your dog won’t be following at a fast pace. Call your dog, your helper will continue moving forward, but will stop enticing the dog to follow. You’ll give your dog 2-3 seconds to respond, if they don’t, pick up the line and reel them in. Reward your dog heavily when he comes to you. We can’t stress enough how important it is to use high value treats, such as cut up pieces of meat, as reinforcements for your dog. Or to use high-value toys that your dog doesn’t get to play with on a regular basis. You have to be more interesting and rewarding than the other distractions in your dog’s environment. *For long-line help, please contact me. Be sure to check out Rocket Recall: Part I! 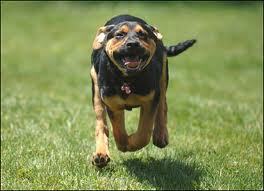 Now that you’ve established with your dog that hearing their name and coming when called is FUN! You can move on the next level of training a Rocket Recall. Just as stated in the last article, there will always be competing motivators in your dog’s life. “Should I go to my person or go smell this really interesting bug over here?” We want our dog’s answer to be “go to my person” every time. During the first level of Rocket Recall training we didn’t want to call our dogs off anything fun or call them to us and then do something non-fun with them. We wanted to build a very positive association with coming to you. We are now going to up our game with our dogs. In this next level, we will be adding distraction and arousal. It’s important to move onto this next level ONLY if your dog is ready for it. We will now set our dogs up in controlled environments, practice in fenced in areas or have our dog on a long-line to prevent them from running away. Have a friend or family member assist you for level II training. Your assistant will have some treats on hand (preferably of lower value than your treats at the start). They will lure your dog away from you and feed some of the treats. Then you will call your dog’s name, when you do this, your assistant will stop treating and ignore the dog. This means no eye contact with the dog or motion of any sort. Repeat your dog’s name once more if needed, as your dog turns towards you, use encouraging body language and sounds to get your dog moving in your direction (squatting down, open arms; kissing noises, squeekers). As s/he does, use your Recall word. When your dog reaches you, praise lavishly and give small, high value treats for a solid 30 seconds. Your dog learns in that moment that coming to you even when there are other distractions is more reinforcing! We will now do the same exercise but, in addition to distraction, we’ll be adding some arousal too. Have your assistant encourage your dog to chase them, maybe have them entice your dog with toy if they aren’t interested in the chase. As your dog is chasing your assistant, call your dog’s name once. In that instance, your assistant will stop and freeze. Toy goes away and the person ignores the dog. Call your dog’s name once more if needed, encourage your dog to come you using body language and sounds (squatting down, open arms; kissing noises, squeekers). As your dog moves towards you, use your Recall word. When your dog reaches you, praise lavishly and give small high value treats for a solid 30 seconds. Note–If your dog seems to enjoy chasing people, you can run the opposite direction of your dog to encourage him to come into you at a faster pace. Having a dog come to you when called is one of the most important cues for any dog to know. This cue can save a dog’s life. Yet, many dogs have what we like to call “selective hearing”; they come when they want to. 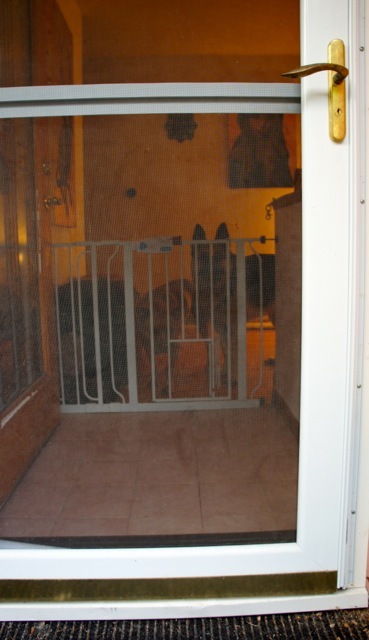 The reasons behind a dog refusing to come when called depends upon the competing motivators and the dog’s previous experiences. For instance, if you are at a dog park with your dog and you call for your dog, you have the competing motivators of the other dogs around him. Plus, if the only times you call your dog to come to you is when it’s time to leave, which is no fun for your dog, you have previous experiences that your dog perceives as negative. He’s going to continue to play with his buddies and ignore you. We have to reinforce coming HEAVILY at the start and always make sure we’re keeping it fun for the dog. Do Not call your dog to you to do something they don’t like or is non-fun; such as: nail trims, bath time or being crated. Instead go and get your dog, because you’ll probably have to anyway if they haven’t had proper recall training up until this point. We don’t want to poison the cue. Always have reinforcers on you when you’re working on recall training. 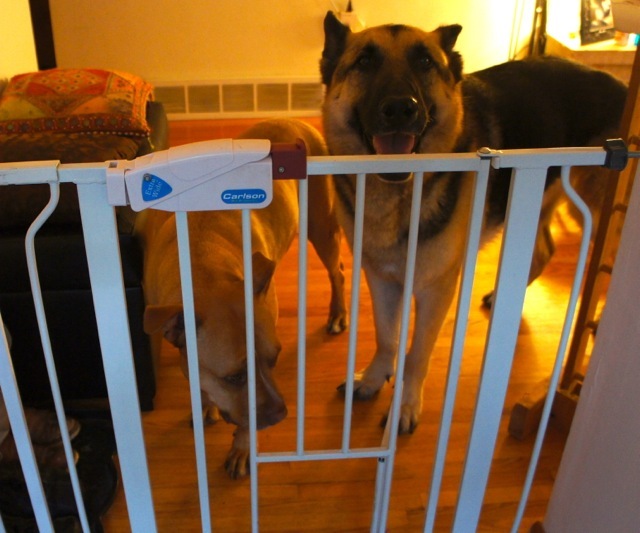 Reinforcers are what the dog likes, not what you think the dog likes. Food is always a great choice because it’s a primary reinforcer for all animals. When practicing in open spaces, always have your dog on a long-line for safety. I do not advise using shock collars or other aversive training devices, since many dogs develop behavioral issues when such items are used on them. Your dog should know his name well, which is the first step for recall training. Practice the Name Game with your dog to develop a strong association between their name and good things happening! Grab some treats or do this at meal time and use your dog’s kibble. Toss a treat to the floor, once your dog eats the food, say his name once, when he turns his head to look at you, say YES! and toss another treat to the floor. Continue this game until your dog is whipping his head around to look at you. Again you can toss a treat, only a little further away this time. Your dog will go out after the treat. This time as he finishes, say his name, when he gives you his attention, take few steps backwards whilst kissing to him or patting your leg, encouraging him to follow you, when he does, say Come. When he gets to you, say YES! and directly hand feed him a treat. We’ve all been there, you walk into a room and bam, paws are assaulting you. Sometimes this is welcomed, but more often than not, it’s considered rude and can even be dangerous if the dog is large and knocks you over. So why do dogs insist on jumping on us? Don’t they know it’s rude behavior?! Well, to them it’s not rude and if they’re not taught how to appropriately greet people, they will continue to jump on us. Dogs jump up on us for multiple reasons, most often out of excitement to see us and wanting to be closer to our faces to smell and lick us like they might do to a dog friend. If we don’t teach dogs an alternative behavior and just reprimand the jumping behavior, we may not get through to the dog what we want or worse our dog may start to fear us. We don’t want to punish our dogs for being excited to greet us, but we also don’t want to reinforce a behavior we don’t like. That’s where teaching desirable behaviors to our companions is favorable for both humans and our canines. The first step is preventing the dog from jumping on us at all; we need to be proactive with our dogs. If they are able to rehearse the action of jumping, they will continue to repeat those actions. And if they are repeating those actions, it is because they find the outcome rewarding. Preventing the jump is simple, but not always easy. Here are a few tips to help with jump prevention. Keep a leash on your dog when you’re home, so that you can easily step on the leash or take up the leash when people come into the home. Tether your dog when guests arrive and tell your guests to approach your dog in an appropriate manner, if your dog starts to jump, have them turn away from your dog immediately. Turn back towards the dog when he has all four paws on the floor. Do this yo-yo approach until the dog is keeping all fours on the floor to receive a greeting. Keep some of their meal set aside with a few goodies added, when you arrive home or when guests arrive, toss the food on the floor to keep your dog’s attention directed downward whilst creating a positive association with guests coming into your home. Make use of baby gates. If you get home and fido loves to jump on you, use a baby gate or exercise pen to keep him from greeting you right at the door. When his feet are planted, you’ll greet him, otherwise ignore him. Teach him to retrieve a toy. Then keep a few special toys stashed away and only bring them out when people come to the door. Toss a toy to direct your dog’s attention to do something other than jump. Teach a reliable Sit or Down. 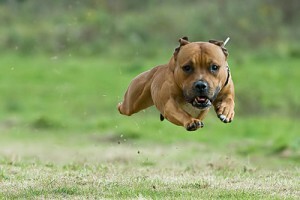 Known as an incompatible behavior, dog’s can’t be jumping if they’re sitting or laying down. 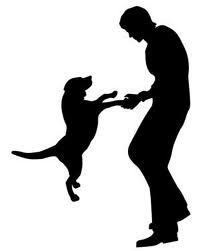 Teach your dog to “jump” on cue. By teaching them to jump, you can easily teach them an “off” cue as well. Not only that, but after dogs learn to jump on cue they are less likely to offer the behavior unless it’s cued up. Last, but not least, be sure to heavily reward and at a high rate for when your dog is offering other behaviors besides jumping. By rewarding what we like, our dogs are more likely to repeat what we’ve rewarded in the past. Many of the above tips can and should be combined to increase the chances of your dog succeeding. For more details about training, please contact me to set up a training or behavior session. When January 1st rolls around, everyone seems to have new resolutions on their mind. Whether it’s to lose weight, quit smoking or watch less tv, people are pretty diligent about it for the first few days… and then quickly go back to their old habits. My message for people this New Year is to turn resolutions into good habits and stick to them. In addition to making resolutions for yourself (which I hope you stick to), make resolutions for your pets. Training our dogs is an ongoing process. We don’t bring a dog home, train it for two weeks and then call it quits. Every interaction we have with our dogs is essentially a training session, which means we are training our dogs throughout the dog’s lifetime. As a New Year’s resolution for my pets, I want to spend an average of fifteen minutes a day working on fun and/or meaningful behaviors with them. The fifteen minutes can be spread out, in fact, it’s probably more fun and effective if the sessions aren’t always blocked into one formal training session time. Instead, training is woven into our day and by keeping it random and spontaneous, the animals never know when they will be reinforced! It’s this same concept that makes gambling on slot machines so addictive for humans! Let’s not forget about our other furry and feathered friends. Parrots, cats, rabbits, etc. can all be trained using positive reinforcement training methods and most excel with the use of marker signals such as a clicker. So be creative and have fun. Get out there and train with your pets. Not only will it give your pet some mental stimulation and exercise, it will help reinforce the bond the you have with your pets and have them respect and be more attentive to you! Tethers can be a useful training item, just like crates (when appropriately used). They are handy because they can moved from room to room more easily than a large crate can be and they take up hardly any storage space. How can they be used and when? Tethers are great for teaching dogs to settle and for keeping them out of trouble. Young dogs or newly acquired can often get themselves into trouble by venturing into areas where they are prohibited, chewing on items they aren’t allowed to have or relieving themselves indoors. By keeping your pooch on a tether when you aren’t available to supervise, you can keep your dog safe and your belongings in-tact. Tethers also come in useful for when guests arrive. 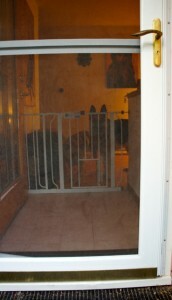 Your dog is kept from greeting inappropriately and your guests are allowed the chance to make it through the door safely. Then training can begin; guests can be instructed to ignore the jumping, overly excited dog and only give attention to the dog when he contains himself. Quickly the dog will learn that the only way to get guests to approach and give attention is to remain with all four feet on the floor! 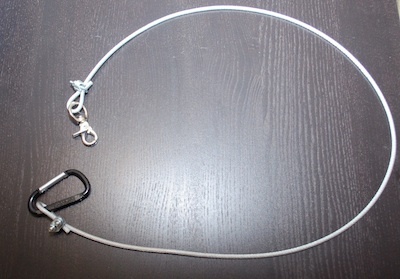 Tethers can be purchased, but are also easy to make yourself for a low cost. 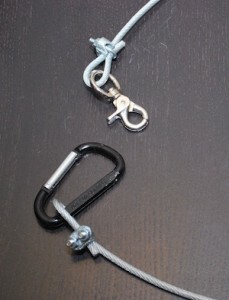 I create tethers out of 1/4″ coated cable, a few fasteners and some snaps (see pictures below). Tethers ranging in length from four to six feet seem to be the most convenient and useful. I typically attach the tether to a sturdy piece of furniture or I will screw an eye-hole screw into a stud in wall and attach it to there. I then supply my dog with a comfortable spot to lay down and some chew toys and/or enrichment toys. 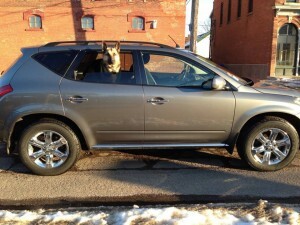 I typically do not leave my dog on tethers for extended periods of time, nor do I leave the house with them attached it. In the beginning, I will mark the behavior (e.g. Click or YES) and treat the dog whenever they are calmly laying on their bed or engaged in chewing/interacting with something appropriate. Gradually, as the dog learns how to settle in the house and how to entertain themselves with appropriate items, the tether will no longer be needed. This past weekend I attended a seminar taught by Alexandra Kurland. The emphasis was on clicker training with horses, but most of the material covered and lessons learned could be applied to any animal. I was fortunate enough to be able to work with my friend’s POA, Glasswing. This little pony did an excellent job. I, on the other hand, seemed to fumble a bit more. Even though I’ve been clicker training for a number of years and have used clicker work a small bit with my own horses, I still felt like a complete amateur at this clinic. 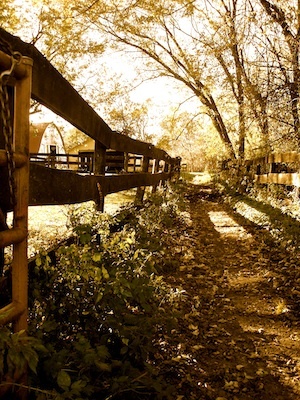 The amount of information one has to remember is overwhelming at times; where to hold your hands, how to walk smoothly via the Tai Chi walk, breathing, where is your horse and what is she doing? Whew. But when it all comes together, Magic. We walked in sync; Glasswing aware of my subtle movements and I of hers. Over the weekend, I made some great new friends and had a more balanced walk and self carriage. Alexandra is a wonderful teacher and it was a great pleasure to work with her. I will definitely be heading to the barn more often to see what behaviors my horses and I can play with. I’ll also be able to add some new ideas to my dog classes as well. There is so much information that can be communicated through a lead line or a leash that is important for people to feel and see the difference between having a light, loose, relaxed feel and a heavy, tight, anxious feel.